: Monday Night Club - Birthday Bash!! Monday Night Club - Birthday Bash!! After a nice relaxing weekend there is no better way to get back in tune and kick start the rest of the week than Monday Night Club! Happy Birthday to Jez Stevens who celebrated his Birthday on Monday, Jez is one of our regulars at Reading were there was some great racing on display, which in turn led to a really exciting event. There was late drama in Reading this week as Jez stevens was pipped to the finish lane at the last lap by Seb Domagala who hit a impressive time of 24.25s. Jez still holds the 2013 record for lap times though so I am sure the rivalry will continue. Join in the action at Reading with our Monday Night Clubs! All of this weeks winners at Monday Night Club are new to the Hall of Fame, proving that our regular drivers can be beaten! so a very well done to all of them and to everyone else who was involved in making Monday Night Clubs the great events that they are. Don't forget to follow us on Twitter to keep up to date with latest offers and any upcoming promotions @teamwrkskarting and tweet about your own experiences behind the wheel. Monday Night Club gives you unlimited racing for just £22.95: you race as many sessions as you like between 6.30pm and 9pm, racing against our regulars and newcomers. Monday Night Club runs every Monday evening throughout the year. 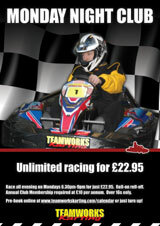 Unbeatable racing at unbeatable prices! Monday Night Club - New 2013 Records!